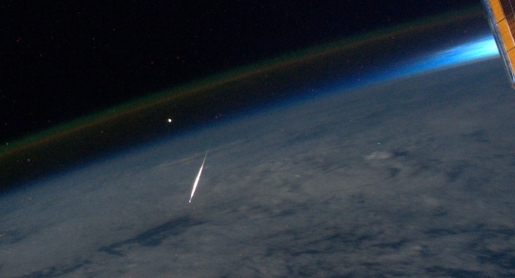 The Perseid Meteor Shower as seen from space. You can get some pretty awesome views from the International Space Station, right? I mean, first Italy dresses up for the ISS, and now they’re capturing photos of the annual August Perseid meteor shower from a very unusual vantage point. For example, an astronaut on board the ISS captured an awesome view of the Perseid meteor shower, then the very same astronaut tweeted the image. Great shot, right? It’s kind of a once-in-a-lifetime look at what a meteor shower actually looks like while in progress. The man responsible for the photograph is an astronaut named Ron Garan, who is one of NASA’s current astronauts on board the ISS. Garan was launched from Earth in April as a member of the Expedition 27 crew; he’ll be returning to Earth at the end of his six-month tour of space duty. Until then, hopefully he’ll continue to tweet more awesome photos from his unique vantage point.